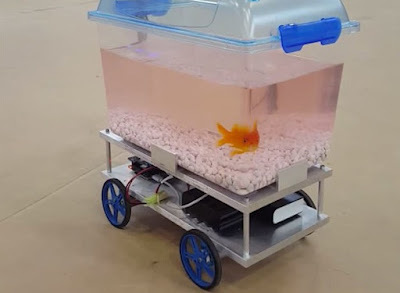 Built by member of Build18 at Carnegie Mellon University (and filmed by someone who doesn't realise that their phone - and the whole internet - works in landscape), the tank uses a camera to track the fish's position, and then moves the motorised tank in that direction. So if the fish keeps swimming to the left, the tank moves to the left. Forever and ever. Trouble is, where will this end? One day fish might have their own special suits with legs and guns. They'll come after us, won't they? This is the end.